A few months back, MCV claimed a SingStar: Beatles game was on the way. Harmonix then said it was a "misheard rumour". Turns out they were both right. 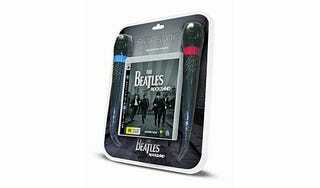 Meet The Beatles: Rock Band: SingStar, for the PS3. It's a mouthful, we know, but it's also real, and constitutes one of the strangest franchise couplings we've ever seen, what with the two franchises being competitors and all. It includes a regular copy of The Beatles: Rock Band and a pair of wired microphones, all the while carrying the branding of both music franchises. You want extra instruments? You go get them yourself. It's out later this month, is definitely targeted at the older crowd who are more likely to sing than hold a plastic guitar, and is most likely for PAL regions only.